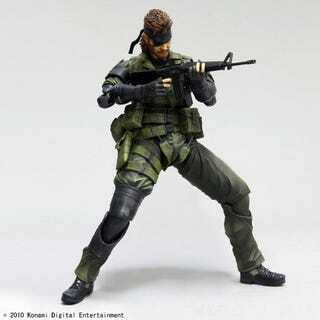 Square Enix has released the first set of official images for its second Metal Gear Solid: Peace Walker action figure, this time featuring Snake in his jungle fatigues. It's retailing for around USD$55, but as of today only has a Japanese release frame, which is sometime around November. Square Enix's Play Arts figures may look a little janky at times, with their joints so obvious, but hey, you want posability in a figure, prominent joints is what you get.